Many, if not most, systems designed for manure treatment depend on reliable solid-liquid separation. What is solid-liquid separation for manure and when is it something to consider doing for your farm? Manure can be thought of as a mixture of water, minerals, and organic components. Some of the minerals will be soluble and dissolve in the water, while the rest will tend to settle to the bottom or float to the top of the manure storage. The density of the organic components will determine whether they settle to the bottom of the storage unit, remain in suspension, or form a floating crust. The amount of water, source of manure, and manure handling system will determine the extent of these trends. 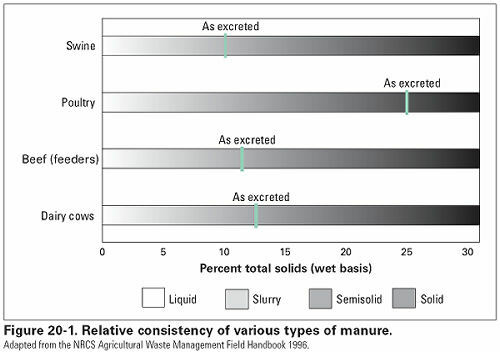 More on solid-liquid separation’s role in manure storage…. The single most important factor affecting the tendency to separate is the amount of water in the manure. With low moisture (solid) manure, very little apparent separation takes place. As the moisture content increases the tendency for separation also increases. When characterizing manure’s physical characteristics it is often thought of as being a solid, semisolid, slurry, or liquid. From a practical perspective separation is limited to liquid, slurry, and sometimes semisolid manure. When is it Desirable to Separate Solids and Liquids? Whether the tendency for manure to separate into liquid and solid fractions is desirable depends on the objectives of the manure handing systems. In concrete pits and holding ponds it is usually undesirable because the manure often needs to be remixed to remove settled solids and obtain uniform material for land application. In other situations this tendency for separation is desirable. If some of the land application sites are significant distances from the manure source, being able to concentrate manure solids reduces the volume and expense of transportation. In some areas of the nation phosphorus application rates are an environmental concern. Separating the phosphorus with the solids while leaving most of the nitrogen with the liquids may be an option. After separation, the liquids could be land applied near the manure source as a nitrogen fertilizer. The solids could be transported and applied to fields in need of phosphorus fertilizer. Source: CC 2.5 karl vandevender; Livestock and Poultry Environmental Stewardship Curriculum Lesson 20. Even if transportation distance and phosphorus application rates are not a concern using solids separation prior to storage reduces the solids accumulation in holding ponds and lagoons. This increases the time between sludge removal operations and maximizes the liquid storage capacity of the holding pond or lagoon. Another potential benefit is the reduction in odors. Under the anaerobic conditions found in holding ponds and lagoons microorganisms produce odorous compounds. Reducing the amount of available manure with solids separation tends to reduce the production of objectionable odors. In animal confinement systems where water from holding ponds and lagoons are used to flush manure from the barns, solids separation can result in a better quality recycle flush water. The separated manure solids have a reduced moisture content and increased nutrient concentration both of which increase its value as a fertilizer source. In addition, depending on the resulting moisture content it becomes a potential compost ingredient. Where the resulting compost may be used as bedding or potentially marketed off farm. Manure separation is also likely to play a critical role in preparing manure for conversion in into energy. Different energy conversion technologies will require the manure to have different physical and chemical properties. There are a lot of different options for solids separation. Some, like settling basins, use gravity and time to allow manure solids to settle out of solution. These systems are a non mechanical low tech approach with the resulting solids typically being a wet slurry. In contrast the mechanical approaches such as inclined or vibrating screens, belt or screw presses, centrifuges, and many others result in separated solids that while still having significant moisture can be handled and stored as a solid material. Often the separation process can be enhanced through the use of chemicals. Some chemicals work by converting soluble mineral compounds into insoluble compounds. Other chemicals work by causing smaller particles to clump together into larger particles. Depending on the situation these chemicals may be used by themselves or combined.